One day St. Augustine was walking along a shoreline contemplating God after several minutes he came across a small boy carrying a small bucket running between the ocean and a hole he’d dug in the sand. Watching him for several minutes Augustine became puzzled and asked him what he was doing. The boy told him he was putting the ocean into the hole he’d dug. Augustine chuckled and told the boy that was impossible that the ocean was too big. Without stopping the boy looked Augustine straight in the eyes and told him God was too big to put into his mind. Augustine surprised at the answer turned walked away then suddenly he turned to ask the boy another question but he was gone. In our “take it apart and find out what makes it tick” world where everything needs to fit neatly in a box try as we might but the Great I am will never fit in any box. So in my simplistic way of thinking it might prove more feasible for us to put ourselves in God’s box rather than trying to put him in ours. Does that make sense to you? If you’re curious as to what God’s box looks like it doesn’t have four sides a top and bottom. 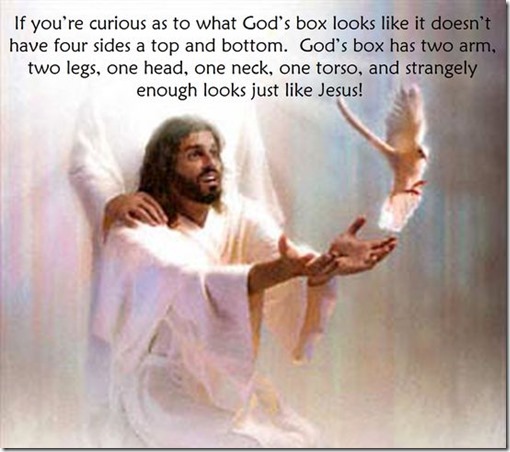 God’s box has two arm, two legs, one head, one neck, one torso, and strangely enough looks just like Jesus! Stranger even then that it is Jesus! Once you’ve put your life in Jesus’ hands you’ve entered God’s box. And there’s one thing you can take with you for the rest of your life GOD TAKES CARE OF THOSE WHO LIVE IN HIS BOX! Life offers us many boxes but GOD’S BOX is the one that really matters. Scriptures marked AMP have been takenfrom The Amplified Bible., Copyright © 1954, 1958, 1962, 1964, 1965, 1987. La Habra, CA: The Lockman Foundation. All rights reserved.